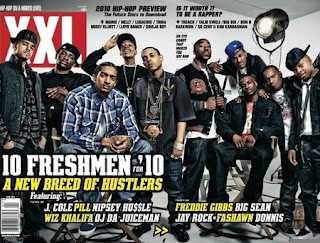 "The new breed of hustlers includes: Roc Nation’s first signee J. Cole, gangsta rap up-and-comer Nipsey Hu$$le, newly-minted Asylum lyricist Pill, 1017 Brick Squad member OJ Da Juiceman, indie-sensation Wiz Khalifa, G.O.O.D. Music’s own Big Sean, underground favorite Fashawn, Gary, Indiana rep Freddie Gibbs, West Coast phenom Jay Rock and the latest addition to the Atlantic roster, Donnis." I didn't know Donnis got signed to Atlantic (I guess I'll be hearing "Dope Girl" as a single sometime soon).